It is just what I had thought it would be and more. I love it. The blue is beautiful. It is just the right size I was looking for. 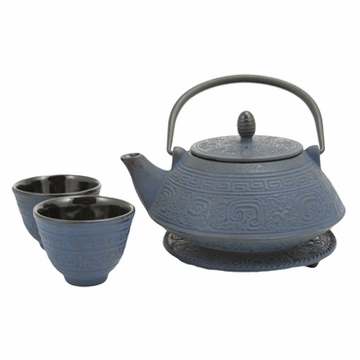 I've ordered this tea set for a gift and I'm very pleased with what I just received, it looks exactly as the picture`good quality, shipping was fast, even though I live in canada and the tea sample smells so good! I've been shopping for a cast iron teapot for over 6 months. I finally decided on this one. 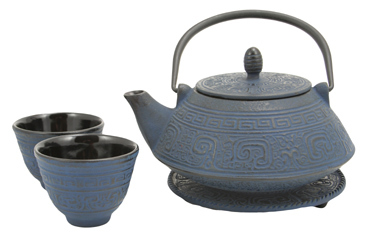 It is so beautiful, and I made tea in it today and it was delicious. The order shipped promptly and they included a free sample ( the sample was huge!) of tea for me. I look forward to enjoying my tea for many years from this gorgeous teapot.